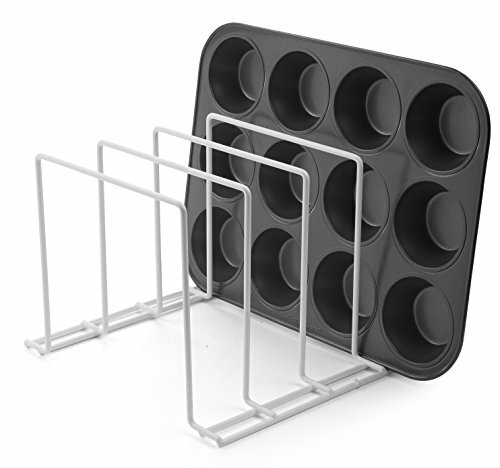 The Stock Your Home Large Steel Bakeware Organizer Rack is made of durable coated steel. The dimensions are 10-3/4" x 10-1/4" x 7-1/2" high. Get two racks with 4 slots each to store: cookie sheets & bakeware, cutting boards, serving trays, placemats, large plates & platters, pots and pans, and more. This sturdy, multi-use home organizer can also be used to store clothing, towels and bed linens, magazines, office and craft supplies, LP's, and more. No assembly required. STOCK YOUR HOME LARGE STEEL ORGANIZERS: The Stock Your Home large bakeware organizer rack is made of durable coated steel. The dimensions are 10-3/4" x 10-1/4" x 7-1/2" High. MULTIPURPOSE USE: With 4 large slots to store cookie sheets, bakeware, cutting boards, serving trays, placemats, large plates, platters, pots, pans, and more. This multi-purpose houseware organizer can also be used to organize and store clothing, towels, bed linens, magazines, office and craft supplies, LP's, and more. TWO IS BETTER THAN ONE: Get two large organizers to conveniently store your housewares instead of struggling to find space in the cabinets. NO ASSEMBLY REQUIRED: This organizer rack comes pre-assembled and ready for use, so you can start storing and organizing your houseware, bakeware, and cookware immediately! View More In Pot Lid Holders. If you have any questions about this product by Stock Your Home, contact us by completing and submitting the form below. If you are looking for a specif part number, please include it with your message.